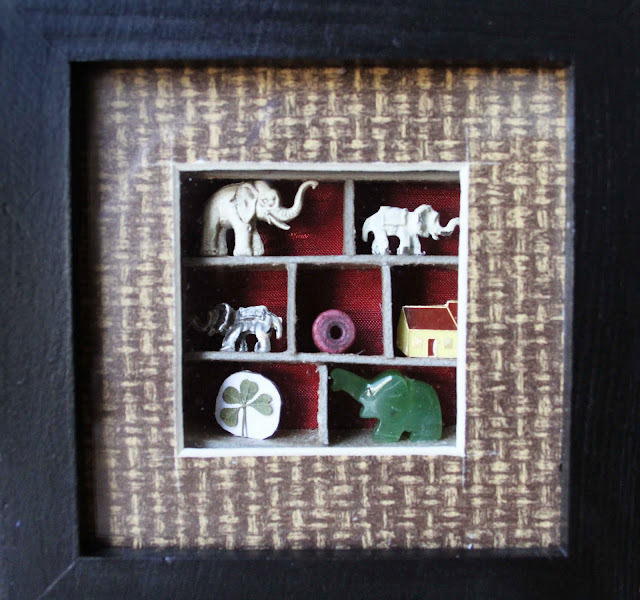 This little 4"x4" shadow box frame combines my obsession with miniature elephants and the cabinet of curiosities. The shelves are just pieces of cardboard cut and glued to the back of the frame, and the objects are things I have collected over the years (two of the elephants were originally beads from a necklace I received from a friend when I was in Grade 5). The four-leaf clover is the only one I have left. When I was a child, my family used to go to the same cottage every year on Georgian Bay. In the middle of the yard, there was a little patch of grass that was always full of four-leaf clovers. Every year, my sister and I would jump out of the car after the 2 hour car ride and race for the clover patch to pick as many four (and sometimes five) leaf clovers as we could find. I used to tell my little sisters it was a magic clover patch, but secretly, I would wash my hands after because I suspected it must have been a chemical spill that caused them to mutate.